This Doylestown, Bucks County home features formal gardens designed within an enclosed courtyard. 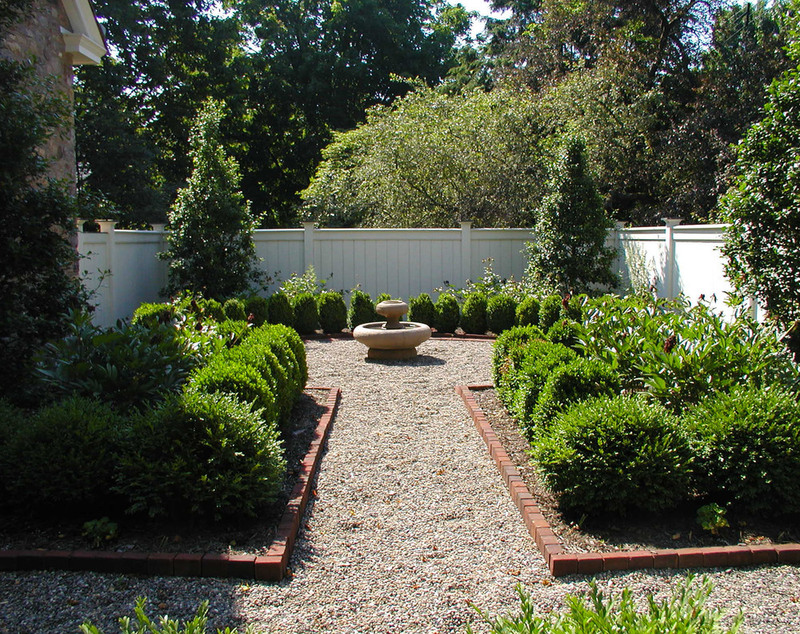 The landscape design features boxwoods, a bluestone patio for outdoor dining, and an open lawn area. The project team included architect Lynn Taylor Associates and landscape contractor Bucks Country Gardens. The garden spaces around the home were designed in concert with the major building renovation work undertaken prior to occupancy. Two primary garden spaces were designed, each to serve a distinct function: one space is more intimate and inward focusing, providing paved outdoor dining spaces adjacent to the kitchen, while the other emphasizes the expansive nature of the long back vista, endowing the property with a larger, less formal gathering space. The new library addition and the demise of a large Sugar Maple tree provided the impetus to re-think the design of the enclosed courtyard garden. 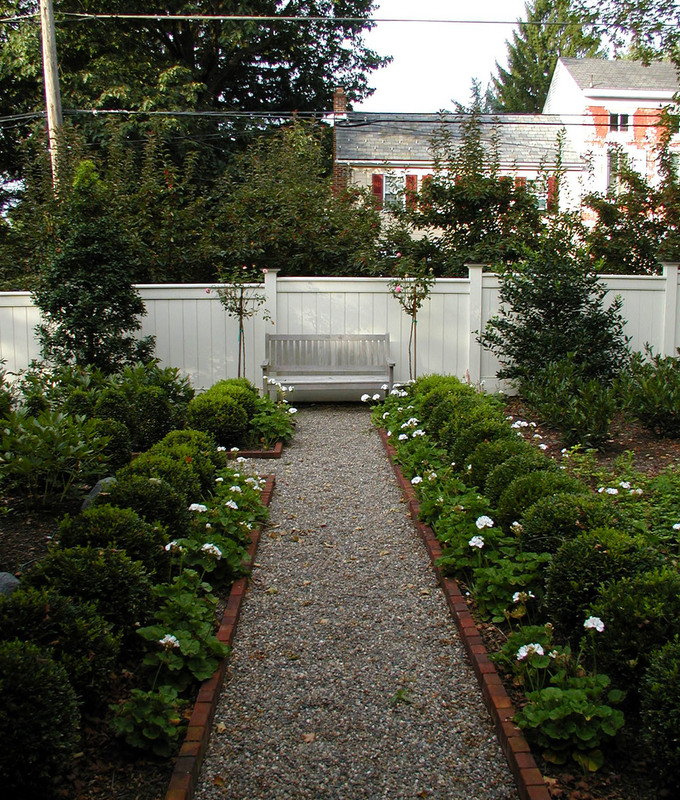 A formal planting and paving scheme was developed, emphasizing a strong framework of evergreen hollies and boxwood, which provides year-round garden structure. Color is provided primarily from seasonal annuals, set against an ever-changing backdrop of taller perennials. Unique plants include the Persian Parrotia [Parrotia persica], and the four American Hollies [Ilex opaca ‘Hart’]. The holly cultivar ‘Hart’ is named after the one-time owner of Doylestown’s own Hart Building on Main Street. 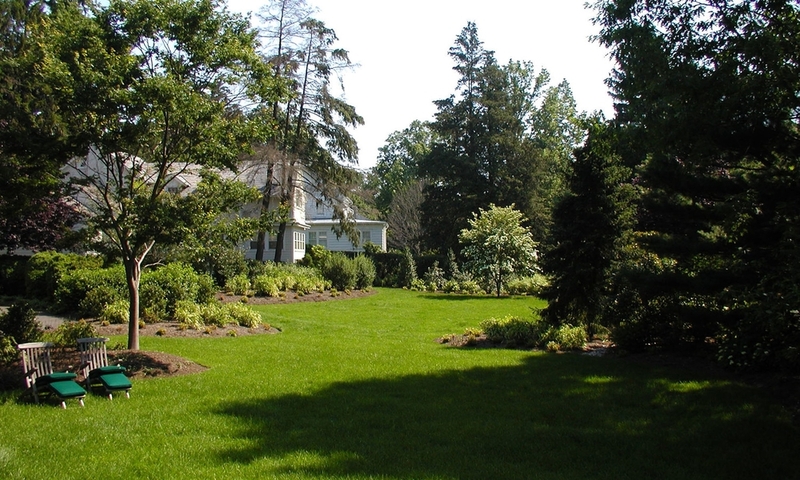 The rear yard was replanted after the adjacent property was purchased. The two rear yards were combined as one unified yard, creating a deceptively large, private park-like space in the center of town. The view out from Mr. Beans library window was given careful consideration, as from this vantage point the view through the yard space is the longest. Groups of plants were added to heighten the sense of perspective creating the illusion of a larger space. A conceptual sketch was created to help the client envision the final space.